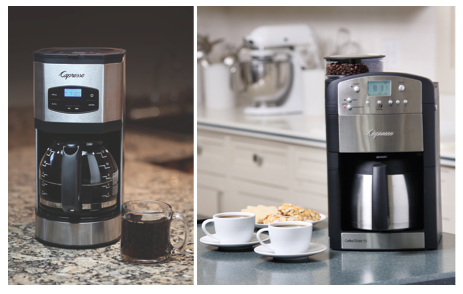 Drip Coffee Maker vs. Grind and Brew: Which Home Brewing System is Right for You? Capresso offers unique coffee makers for the true coffee lover. Choosing a traditional drip coffee maker or a “grind and brew” model depends on what you’re looking for in your coffee brewing experience. Capresso drip coffee makers such as the SG120 are perfect for economical coffee drinkers who want a simple yet superior coffee brewing experience. These machines use ground coffee and follow a classic home brewing technique. While simple in design and method, Capresso drip coffee makers never compromise quality and always achieve superior flavor extraction. Capresso grind and brew coffee makers such as the CoffeeTEAM TS are drip coffee makers with built-in grinders that automatically grind fresh whole coffee beans directly into the filter immediately before brewing. Capresso CoffeeTEAM models ensure the freshest brew and can be programmed 24 hours in advance so you can have fresh coffee when you wake up without having to grind the beans the night before. See the entire line of Capresso coffee makers at www.capresso.com.